Almost limitless possibilities due to its very flexible object-based architecture and advanced flag control. WYSIWYG game design! 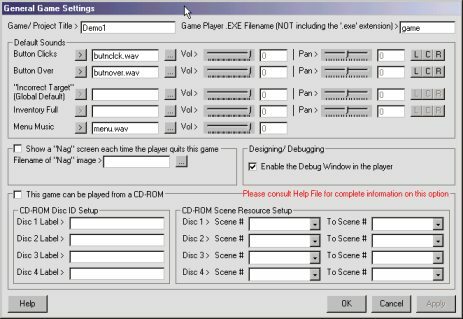 Supports “Opening Logos”, “Intro Movies”, “Closing Movies”, Credits, Game saving and loading, Inventory Items, Interactive conversations, and an optional scoring system. Graphical (point & click) Travel Map (with optionally animated locations). Supports BMP, GIF, JPG, CUR, ICO, MID, MP3, WAV and AVI full-motion video. Comes with a very complete and easy to follow Help File. See even more highlights below! InterAx is absolutely free with no strings attached! No adware. No spyware. No viruses. No kidding! 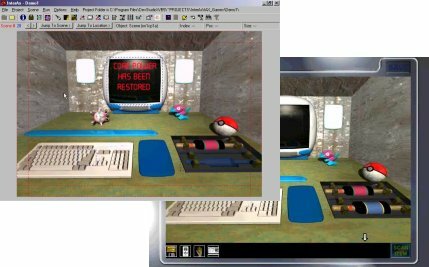 InterAx is an easy to use, yet powerful, game editing system that allows you to create first-person perspective adventure games (such as the original Myst) without writing any code or even a “script”! 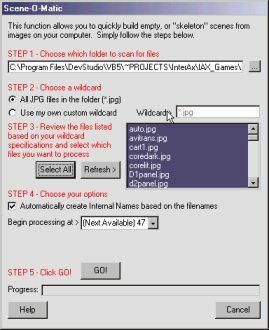 It consists of four programs, the InterAx Editor, the InterAx Player, InterAx Easy Crop, and InterAx Project Scanner. 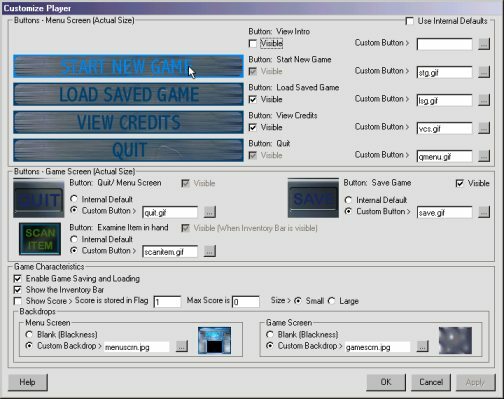 The Editor is what you use to design and create your games, the Player runs the games you create, Easy Crop allows you to quickly and easily crop images to be used in InterAx, and the Project Scanner provides useful tools and information about your InterAx projects. Easy to use, straight-forward GUI (Graphical User Interface). No complicated scripts to write. Objects (and their properties) are used to control every aspect of your game. See Featured Object Types below for details on the different object types. “Help” buttons adorn every window, allowing you to quickly jump to the part of the Help File specific to what you are currently doing. New in version 3.0 are “Quick Tips”. These pop up at various times to tell you a little more about what you are doing at the time. Support for optional custom backdrops, interactive buttons (similar to web page “rollovers”), and sound effects. 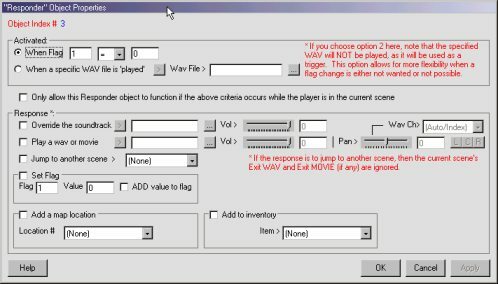 Includes a “Debug Mode” (enabled through the Editor), which allows you to view/change flag values, as well as jump to any scene, give yourself inventory items, and more. There is also a “Notify Window” which lists everything that happens in the background as the game is played. As stated above, InterAx uses objects in order to control your game. This means that depending on how you want each scene to look or act, you insert different objects into it. 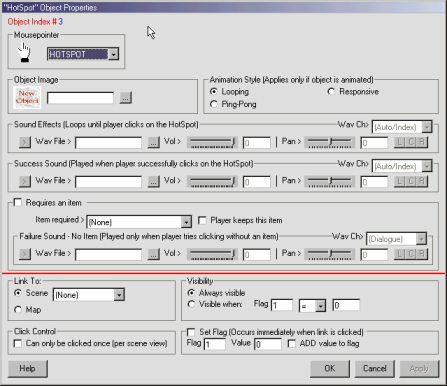 For example, if you would like to have an animation in the background of a scene that is to be used only for “decoration”, you would insert an Ambient object into the scene, and assign the appropriate animated GIF file to its properties. Using a Responder object, you could have the soundtrack change dynamically in response to something the person playing your game might do. 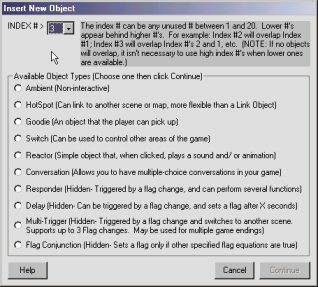 Scene Object: Each scene in your game is considered an object. 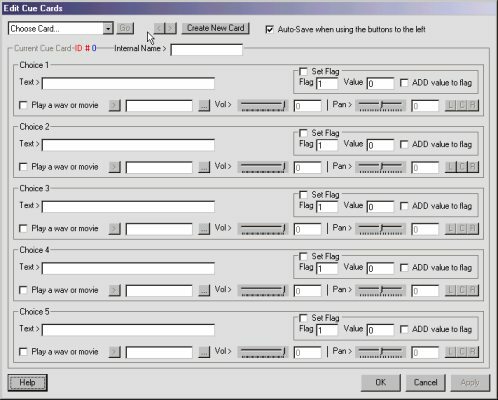 Scenes come “standard” with 4 Link Objects (see next), and additionally, you can insert up to 20 “insertable” objects, in any combination, per scene. Link Objects – (4): These allow you to set “links” to other scenes. By default, these links are located at the top, bottom, left, and right of each scene. You can also move and resize them to suit your needs. If you don’t need all four, or don’t need any in a scene, leave them blank and the person playing your game won’t even know they are there. You can also “link” to other scenes by using certain other object types. Ambient Object: A non-interactive object that can be animated and have sound. HotSpot Object: Can link to other scenes, or even the interactive graphical travel map. Similar to the basic “LINK OBJECTS”, but much more customizable. Goodie Object: An “item” that the player can pick up and put into his inventory. This can be picked up easily, or you may require the player to use another item in order to get the new one. 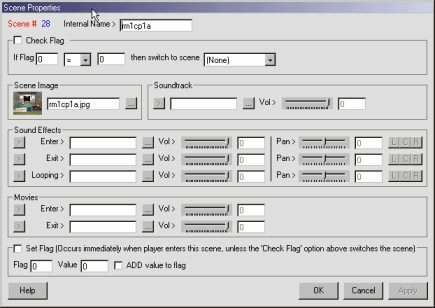 Switch Object: Allows you to control other areas of your game by setting flags, depending on the position of the “switch” (think of it as a toggle switch). Reactor Object: An object with many different options. 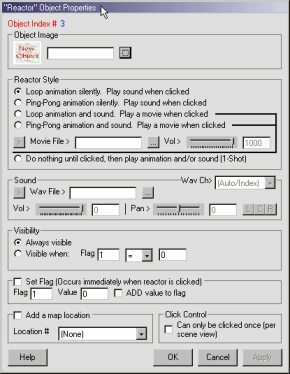 Can be used to play simple animations when clicked, or even play an AVI movie. 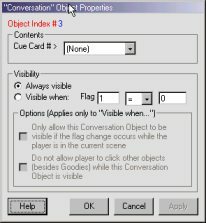 Conversation Object: This object allows you to use a Conversation Box in your game. You can choose up to 5 lines of text, and each line can be clicked on by the person playing the game. In response to this click, you can set a flag, and even play a WAV or AVI movie. 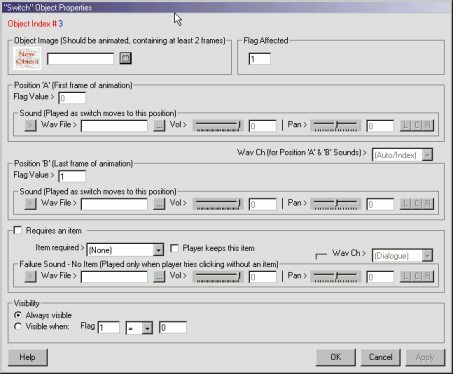 Responder Object: <Hidden*> When triggered by a flag change, it can be used to set another flag, force the player back to the main menu, change the soundtrack, play a WAV or AVI, or switch to a different scene. 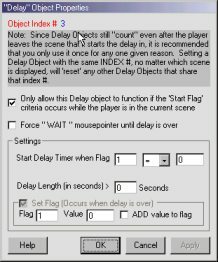 Delay Object: <Hidden*> Once activated, this object counts down a delay that you specify, after which a flag is set. 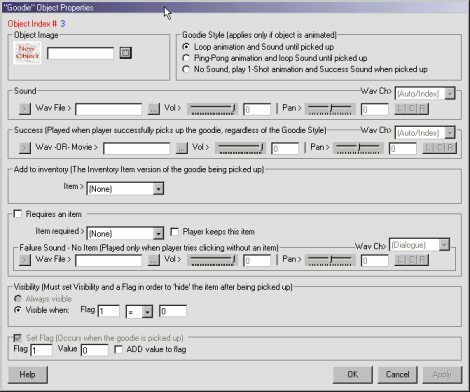 This flag change can trigger many different things, such as visibility of certain objects, or even Responder and Multi-Trigger objects. 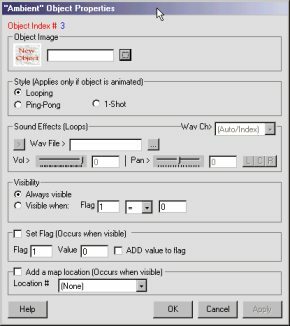 Multi-Trigger Object: <Hidden*> When triggered by any of 3 flag changes, it switches to a different scene. 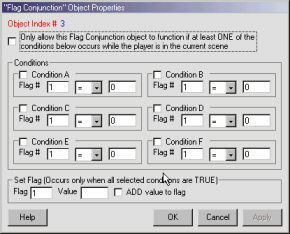 Flag Conjunction Object: <Hidden*> Allows you to check the values of up to 6 flags and if all selected equations are true, then another flag will be set. As you can see, the object types offer much to be accomplished! With enough creativity, the possibilities are almost endless with InterAx! 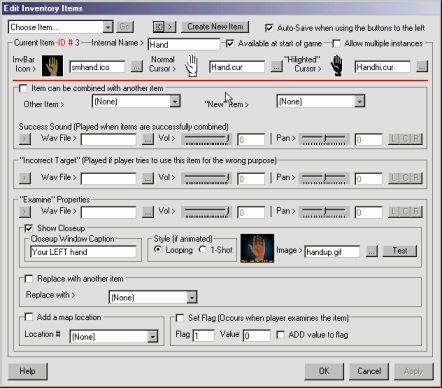 * Hidden object types are objects that cannot be seen when the game is being played, but they interact depending on how you set their properties, and what the person playing the game does.